I love Magic. I've been playing since it came out when I was a kid, though the majority of that time was spent at the most basic kitchen-table level, making janky decks from whatever cards I had lying around. Over the last several years, I've gone deeper into the game, but I'll always be what I like to call a "dedicated filthy casual"—my greatest joys come from playing with friends, with no stakes, and creating ridiculous gameplay scenarios. For what are probably obvious reasons, my favorite format is Commander. It strikes the perfect balance between casual and competitive, and the multiplayer strategy and politics make every game feel unique. But the thing I love most is the deck-building itself: crafting a strategy around an exciting legend, digging deep into Magic's catalogue for obscure synergies, and scheming ways to take down multiple opponents. As awesome as Commander is, it can be pretty hard to get into. It's technically an "eternal" format, like Vintage and Legacy, meaning that some of the most important and powerful cards in the format are also pretty old. Plus, also like other eternal formats, Commander games sometimes hinge on weird combos between cards printed years apart, which can get so complicated you need to make someone slow down and explain at length how, exactly, I'm dead to that Doubling Season, Teferi, Temporal Archmage, Tamiyo, the Moon Sage emblem, Jace, the Living Guildpact, and Jace Beleren (this one courtesy my boss, Blake, because of course). And that's cool and everything, but it can also get exhausting. Enter: Brawl! With the singleton deck-building requirement, the legendary leader, and the multiplayer focus, it gives me a lot of what I love about Commander. But the smaller card pool makes it a lot easier to get into and cuts down on the wildly complex card interactions, while smaller decks and a narrower range of strategies lead to faster games. One of the biggest ways Brawl diverges from Commander is that it allows planeswalkers as commanders. Since all I really want in life is to be allowed to build a Commander deck with Tamiyo, Field Researcher at the helm, this is really exciting! My beloved Tamiyo is no longer in Standard, however, so I decided to go with the new Huatli, Radiant Champion. I've been obsessed with seeing how fast I could get to her emblem ever since I first saw her, so my super-complex, high-level strategy was to jam in as many cheap creatures and token-makers as I could find. And… that was pretty much it! The current Standard pool contains tons of efficient, powerful creatures in green and white, and since I wasn't worried about tribal or mechanical synergy, all I had to do was pick my favorites. I got my first chance to test out "Huatli Crüe" (please don't throw anything heavy at me) at a Brawl event here at Wizards HQ recently, and I couldn't wait to see what my coworkers had brewed. Well, I got my first surprise right away, because my pod comprised my Huatli deck, a Locust God deck, a Kambal, Consul of Allocation deck, and… another Huatli, Radiant Champion deck! I don't go to events with "gala" in their names, but I'm pretty confident this is like showing up to one of those and seeing one-third of the other attendees wearing the same fancy outfit. Naturally, I drew pretty much every noncreature spell in my deck. The other Huatli player was using lots of token-producing instants and sorceries, and the Locust God deck was pretty creature-light, so that grouchy little Human Advisor (and his nefarious Vampire friends) ate a LOT of life points from the rest of us. In something like two turns, my opponent's life total shot up past 60—roughly the total of all three other players put together, which is just uncalled for. But the thing about multiplayer Magic is that when one person gets so far ahead of everyone else, they basically paint a big fat target on their own head. So it was for the Kambal player. We all teamed up to shut down the life-stealing machine, and when the dust settled, he was left with one lonely Legion Lieutenant. Something similar happened to my rival Huatli pilot a short time later. Thanks to his army of assorted tokens, Huatli's +1 ability catapulted her to more than 10 loyalty the same turn she hit the board. So once again, the rest of the table came together in coordinated panic to knock her down out of ultimate range—which, in the end, we accomplished by killing her entirely. I felt a little bad for participating in the ruthless destruction of my beloved general's twin, but it led to my favorite moment in the whole game. I had my own Huatli out, and had managed to get her within ultimate range if she survived until my next turn. Naturally, the Locust God player managed to conjure an army of hasty flying bugs to send at her face. But just as I was about to sigh dramatically and send her back to the command zone, the other Huatli player cast Settle the Wreckage! He was just that loyal to Huatli! This article is dedicated to you, my friend. The game was far from over, but that emblem basically made it a ticking clock. Combined with Oketra's Monument, it meant that every creature I cast produced a bonus Warrior token and drew me two cards (one for the Warrior token). 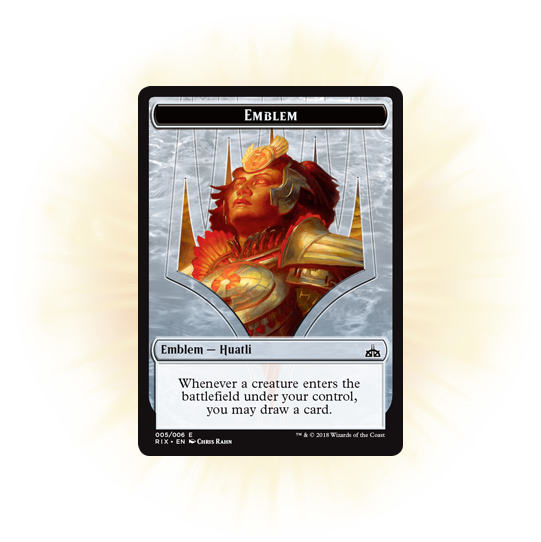 Even though the Locust God player had an incredible engine online with Drake Haven and was pumping out more tokens than I could count, the emblem-Monument synergy (with the help of a Majestic Myriarch that really lived up to its name) was simply too powerful to stop. Huatli Crüe was victorious. It's social! Discussing strategy or simply chatting while another player is thinking is a great, low-pressure way to get to know people. It's a great use for exciting new cards that don't quite fit into any viable Standard archetypes. The deck-building is pretty easy! You only need one copy of anything, so no need to calculate how many to play or worry about finding multiple copies. It can be a perfect intro to Commander or Standard. I know my Standard collection started off with a lot of one-ofs and cards I liked. If you like it, then you can start digging into Standard with a similar strategy. Ridiculous things happen that would never happen in one-on-one! Settle the Wreckage on someone not attacking you? Multiple board wipes in a row? Doubling your starting life total? These just aren't things that happen in normal Magic. That list is not comprehensive! I'm really excited about this new format—to me, it offers most of the best parts of Standard and Commander. And with Dominaria coming out soon, we're about to be positively showered with legends (awkward), meaning a wider-than-ever selection of creatures and planeswalkers to build around. So next time you pull a sweet legend at a Prerelease or want a little more multiplayer mayhem for your Magic night, I highly recommend you give Brawl a shot. I can't wait to see what everyone comes up with!